I'd approve! Have you watched the new show? When I read this comic I'm going to totally have the Nick voices in my head as the characters speak. I did the same with the Archie TMNT and the original cartoon voices. If enough people buy it, it will continue to print. This is an exciting time for all TMNT fans! Gonna hold out for a season set. I had bought all the ATLA DVD individuals and was bummed when they did nice season sets with extra features. No Blu-ray version? I hope they offer blu-ray when the entire season is released. Damn, they should really do Blu-Ray, all the episodes are out in 1080p, so why not! The climate for buying "junior comics" has certainly changed in that most prefer them on tablets rather than by book, though it will be more important to sell these in more mainstream places as opposed to LCS's, along with a lower price (around $3 a piece). I also hope IDW inserts continuity notes when applicable. Hopefully it won't be script rejects that are placed. I'd love it if this comic shows us important stuff they skipped over on the show, like April meeting Splinter for the first time. It actually really bothers me that Nick skipped over such an important detail like that. April meeting Splinter in every other series has always resulted in her fainting. Because April fainting is such an important part of the series' overall narrative. Maybe CyberCubed has a fetish for unconcious women! Are you playing dumb? It's about the two meeting, not that April has to faint. Splinter and April meeting should have been shown in the show. Lots of people were disappointed it was skipped over. It would be good to see the cartoon fill in gaps of the show. Similar to the Young Justice comic. Last edited by CyberCubed; 01-03-2013 at 11:25 AM. I honestly didn't care that they skipped over it. Yea, but what would they say? We already saw Splinter tell the Turtles their origin story in the beginning of the first episode, so we wouldn't have to see him repeat it to April. That'd be redundant. Why would it have to be an origin story? That would happen offscreen. Even IDW did the April sees Splinter for the first time as a mutant at the end of issue 12. Both previous cartoons and the movies all had the "April meets Splinter" scene and it was done well in all of them. If this comic fills in the gaps of the show, like showing April meeting Splinter, the Turtles facing more criminals outside the Foot/Purple dragons, etc it would be great. I think it would be respectful to the creators of the Nick show to refrain from criticizing them for the sole reason that "everyone else did it." It's a moment that past incarnations chose to highlight and that this one did not. You lost one cool moment for countless other ones that they made with creativity and hard work. If you have a criticism for it, just make sure it's a legitimate one, instead of saying they should have included it because you've always liked it. I don't see how skipping April's first reaction to Splinter is creative. It just made me feel like I missed something. Remember when people were thinking Nick was airing the episodes out of order because April was just randomly in the lair out of nowhere? It's creation of the episodes in general. Choosing which scenes to include or exclude is part of the creative process. Noting that April meeting Splinter always resulted in fainting is you clearly implying that you think it's such an important detail because people (what people, I don't know) liked it in the past. 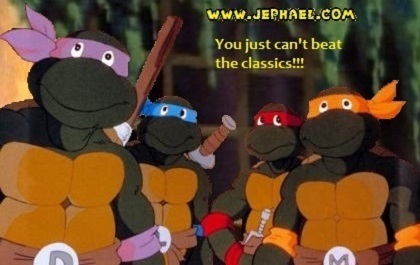 Nick TMNT has no obligations to anyone other than to themselves to make a good show. I'd say stop complaining when they do something different if you can live without it. Since when is something like that based on what happened in the past? April seeing Splinter for the first time is like seeing the Turtles or Foot Soldiers for the first time. We should see important character introductions.